The pentagonal pyramid is one of the Johnson solids. It is bounded by 5 equilateral triangles and 1 pentagon. It is the second polyhedron in Norman Johnson's list, and thus bears the label J2. A pentagonal pyramid of edge length 2 has height √((10−2√5)/5), or approximately 1.05146. It is therefore quite a shallow pyramid, barely over half of its edge length. In 4D, this fact causes the pentagonal prism pyramid, which has two pentagonal pyramid cells, to be very shallow indeed. This in turn has the consequence that a very large number of 5,n-duoprisms, up to n=20, can be augmented with pentagonal prism pyramids and remain convex, thus producing a large number of CRF augmented duoprisms: 1578 distinct augmentations just from the 5,n-duoprisms alone. Two pentagonal pyramids can be attached to each other to form the pentagonal bipyramid (J13). A pentagonal pyramid can be attached to a dodecahedron to form an augmented dodecahedron (J58). Adding a second pentagonal pyramid on the opposite side produces the parabiaugmented dodecahedron (J59). 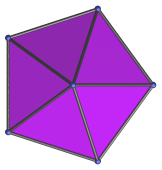 If the second pyramid is added on a non-adjacent, non-opposite face, the result is the metabiaugmented dodecahedron (J60). The latter can support a third augment on a face non-adjacent to the first two augments, resulting in the triaugmented dodecahedron (J61). Projection parallel to pentagonal base. One of the triangular faces projects to the upper left edge. Projection parallel to pentagonal base, with reflective symmetry. The pentagonal pyramid yielded by these coordinates has edge length 2. Last updated 27 Feb 2019.